Oracle Archetypes - Paizo, Inc.
Nihilists focus on the true apathetic vastness of space and time, frequently pointing out that life and joy are rare exceptions. This does not mean the oracle is necessarily evil, but the uniquely grim and accurate viewpoint on death and entropy might wear on smaller minded companions. Recommended Mysteries: bones, dark tapestry, heavens, time. burning hands (1st), unshakable chill (4th), silence (6th), sunburn (see below) (8th), suffocation (10th), cold ice strike (12th), reverse gravity (14th), sunburst (16th), meteor swarm (18th). These bonus spells replace the cure or inflict spells available to the oracle class as spells known at each level. The nihilist must take the following revelation at 7th level. Viability (Su): At 7th level, you can resist the deadliest environments thanks to your attunement to the vacuum of space. As an immediate action you gain cold and fire resistance 10 and can hold your breath for a number of rounds equal to four times your Constitution score. In addition, you become immune to effects related to low pressure or vacuum. At 11th level, these resistances increase to 20 and you does not need to breathe while this ability is in effect. You can cast spells and speak normally while you don’t have to breathe. You can use this ability a total number of minutes per day equal to your oracle level, but each use of this ability must be in 1 minute increments. Your target glows brightly with extreme but momentary radiation that burns its entire body. The target’s skin blisters, inflicting 2 points of Strength and Dexterity damage and a –2 penalty to attack rolls and skill checks. This penalty lasts until all ability damage from this spell is completely healed. 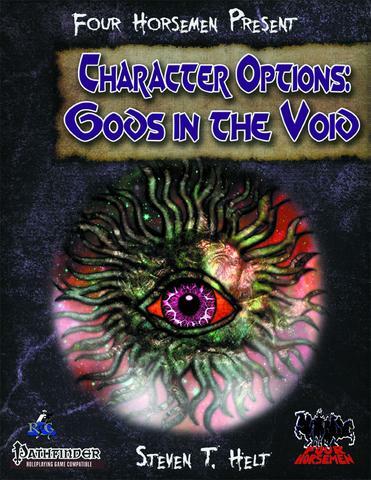 The Four Horsemen Present: Character Options – Gods in the Void © 2015, Rogue Genius Games. Author: Steven T. Helt.